There’s a driver shortage. You know this. We know this. But are you underestimating how aware drivers are of this? Your desperation to hire drivers shows in your recruiting process. Drivers can see that you’re not looking to hire a person or gain a valuable addition to your team. You want a number. One more driver. Maybe 10 more. Maybe 100. But drivers don’t want what you want. They don’t want to be a number. They want to make a living. They want a career. They want to know their employers will take care of them. But how can you take care of them when you see them as nothing more than another body to fill your trucks? Does that describe you? Or does your recruiting tend to come off that way? Thankfully, there are ways to make your recruiting much more inviting to drivers. The thing is to consider the impression you’re making on a driver from start to finish of the recruiting process. So where do you begin? This is your introduction to drivers, with the exception of drivers introduced to you through the likes of word of mouth or seeing your logo on one of your trucks on the road. It’s best to begin with only the parts of your advertising under your control. Taking into consideration that the number of ads a human being sees daily is measured in the thousands, how does your ‘introduction’ stand out? A generic message addressing drivers as ‘the masses’ isn’t going to cut it. So how can you get your advertising to appeal to individual drivers? It isn’t enough to simply state what you offer. You offer great pay and more home time? 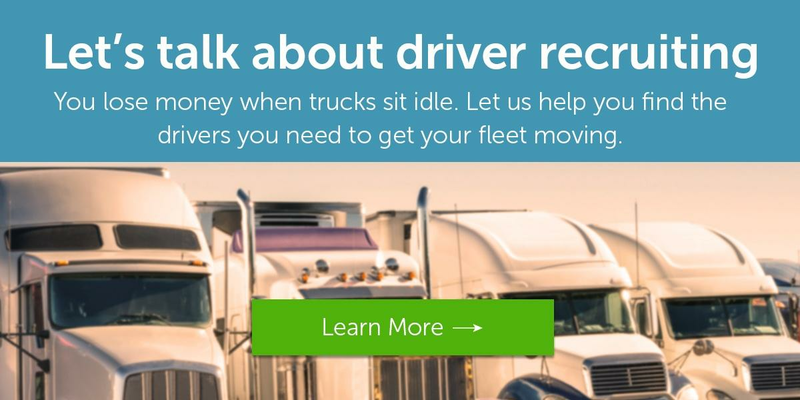 So do hundreds of other companies across the nation looking for drivers. The typical way of presenting such familiar information won’t jump out to a driver. You can express the same information using something a driver can relate to, is interested in, or makes them feel they’re a part of something important. E.g. By presenting the information in a more personal way, you can catch the eye of the individual driver. Talking about how great you are tells a driver nothing about what you can do for them. Keep your advertising focused on what matters to a driver. Cater to a driver’s pain points and their interests. This will involve doing research on your specific driver audience e.g. surveys, getting driver feedback from employees, etc. Knowing your audience allows you to speak directly to what matters to them. Once you’ve gotten a driver’s attention by showing you can relate to them, then they’ll want to hear who you are and how great what you offer is. This may seem like a no-brainer but due to the natural human temptation to present ourselves as a little better than we are, this is definitely worth mentioning. Many companies call themselves the best at what they do in the nation when they’re not. Some might say their company has a family atmosphere when in reality it doesn’t. It’s okay not to be the very best and if you are, kudos to you. The reality is that most drivers are simply looking for a ‘good’ place to work. What are the things your company does well? Get the opinion of your drivers. This goes back to getting employee feedback. Learn your companies strengths and present those in your advertising. The ever-growing usage of smartphones across the nation goes without saying. So as you can imagine, this also applies to drivers. According to our research, smartphones are the primary device drivers use to get on the internet. So consider the fact that you could be losing the attention of drivers simply because your advertising is not built for the primary device they use. Making your advertising mobile-friendly can show a driver you care enough to make the process more convenient for the individual driver. If you offer something other companies do not, presenting this in your advertising is a great opportunity to stand out. Fleets have been known to offer free health care, gym memberships, a tele-counselor, allowing a driver to drive with their pets, etc. Whatever your unique offer is, a brief mention could make all the difference. There isn’t enough advertising out there that speaks to a driver as an individual and it can be hard to stand out from all the generic messaging a driver sees everyday. By making your advertising more personal to a driver, remembering you’re speaking to a human being, and trying to see your advertising through a driver’s eyes can help you humanize your recruiting process.